MESA, AZ--(Marketwired - December 08, 2015) - Syn-Apps LLC, a pioneer in mass notification, business enabled communication processes, and paging solutions centered around unified communications, today announced plans to introduce Valcom to its Certified Endpoint Program. Valcom, a leader in high quality loudspeaker paging and mass notification systems, is currently in the process of certifying select IP hardware products for interoperability with SA-Announce. Valcom plans to go to market with these products in 2016. 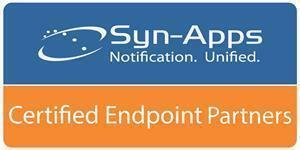 "Valcom is pleased to join Syn-Apps Certified Endpoint Program. It is through collaborations such as this that insures end users have access to solutions that specifically address their needs. We look forward to ever increasing the endpoint options available to Syn-App customers," said John Mason, CEO of Valcom Inc.
Syn-Apps' Certified Endpoint Program expands channel resellers' product portfolios by providing customers a trusted mass notification solution, complete with plug-and-play integration between SA-Announce and certified-Valcom endpoints. This Program helps to facilitate innovation and growth between Syn-Apps and IoT hardware manufacturers while providing mutual customers with the freedom of choice. "We are pleased to welcome Valcom to the Certified Endpoint Program. While we have been partners for many years, Valcom's decision to embrace certified interoperability and testing demonstrates their commitment to serving our joint customers and the notification industry at large. Valcom brings a sizable product portfolio that meets the needs many of our customers and partners have been requesting. Syn-Apps is passionate about interoperability and freedom of choice and are happy to share common interests with industry leaders like Valcom who are committed to protecting people and property through open collaboration," said Ian Pitts, President and CEO of Syn-Apps LLC. Manufacturers participate in the program by integrating Syn-Apps' API and testing their hardware for interoperability with SA-Announce. Use of the API is free of charge to IoT endpoint manufacturers and carries a small fee for mass notification providers that integrate Syn-Apps' API into their own solutions, allowing them to leverage the growing ecosystem of Syn-Apps' certified IoT devices. Since 1977, Valcom has been the leader in high quality loudspeaker paging and mass notification systems along with telecommunication system enhancement products providing solutions for the most sophisticated communication requirements. Valcom's extensive offerings are manufactured in state-of-the-art facilities in Roanoke, Virginia and include page control interfaces, VoIP LAN/WAN connectivity, ceiling/wall speakers, paging horns, analog/digital clocks (wired, wireless and IP PoE) and door entry systems. Valcom is the standard product offering for major telephone companies and the overwhelming choice of Fortune 500 Companies. Valcom's pre-engineered technology uses existing infrastructure (CAT 5/6 cable or existing networks) eliminating costs associated with additional wiring. For more information, visit www.valcom.com or contact Valcom at 1-800-825-2661. Syn-Apps is a leader in paging and mass notification solutions designed to improve business processes, increase safety, and streamline internal and external communication. Since 2001, thousands of organizations have integrated Syn-Apps' notification solutions with phones, paging systems, IP speakers, and hundreds of other internal systems and services. Syn-Apps' flagship product, SA-Announce, provides a single, point-of-activation for authorized users to quickly dispatch critical communication when situations strike. SA-Announce sends notifications to a variety of voice, graphic, and text-enabled devices. Whether informing thousands of people, or ensuring one person receives a critical message, SA-Announce empowers organizations to lower response times and improve productivity through streamlined communication. IoT manufacturers, like Valcom, participate in Syn-Apps' Certified Endpoint Program by integrating Syn-Apps' API and testing their hardware for interoperability with SA-Announce.